If someone offered you free water for your yard and household needs, it would be pretty hard to turn that deal down. Actually, it's there for the taking if you install a rainwater harvesting system. This technique has been in use for thousands of years, but it's becoming an essential feature for a sustainable home. Your roof accounts for a large surface area, and when it rains, this water is typically routed through a system of gutters and pipes and dumped unceremoniously into your yard, where it washes away valuable topsoil. Roof catchment systems, which are the most common type for residential applications, collect this water by routing it through a system of gutters and pipes into a cistern, usually located on the ground level. The choice of roofing material is extremely important as some types can contaminate the water, such as those with coatings or metallic finishes or asphalt. Acceptable roofing materials for catchment systems include aluminum, tiles, and slate or galvanized corrugated iron. A ground rainwater harvesting system is a more simple approach than the rooftop version and offers the possibility of a wider catchment area. Water may be collected via drain pipes or earthen dams and stored above or below ground in tanks. The quality of water may be lower at the ground level, rendering the captured water suitable for landscaping needs only. 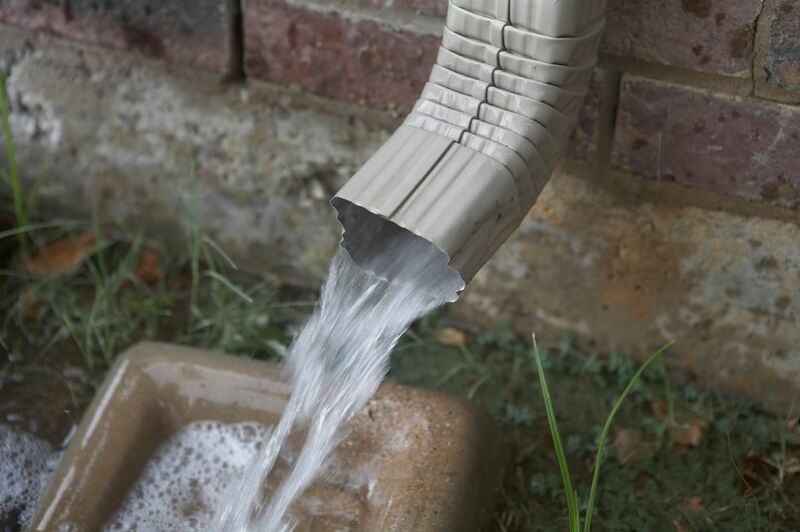 Rainwater systems range from extremely basic, such as a barrel beneath a downspout, to highly technical, including a pump and filtration system. Cost vary accordingly, from as inexpensive as a $200 do-it-yourself system all the way up to $20,000 or more for a complex roof catchment system. Check rainfall statistics in your area to determine if a catchment system is a worthy investment. If you live in a rural area and lack access to municipal resources, rainwater catchment can greatly enhance your well-water source, or if you live in a city, reduce your dependence on municipal water. Other benefits of rainwater harvesting include the reduction of stormwater runoff and lower water bills. Rainwater systems are generally pretty flexible, allowing you to reconfigure them and sometimes even relocate them to a new home. Keep in in mind, however, that rainwater harvesting systems require regular maintenance, such as cleaning the roof surface, piping and storage container to prevent the water from becoming contaminated. Also, standing water is a natural mosquito breeding ground, so you must use netting or other devices to keep them out. Cisterns can be unsightly. It is possible to camouflage them, and if you are really concerned about the aesthetic impact, then opt for an underground version. Before installing a harvesting system, check with your local building code; in many cases, you won't need a permit if you're only using the water outside, but if you pipe it into your home for flushing the toilets or laundry, you'll most likely have to deal with the building department and install separate lines for gray and city water.